I arrived at the Bike Repair Hub in New Columbia on Saturday, April 6th, not knowing what to expect. I hadn’t been to the Hub since the ribbon cutting ceremony back in September, and I was eager to see it in action. 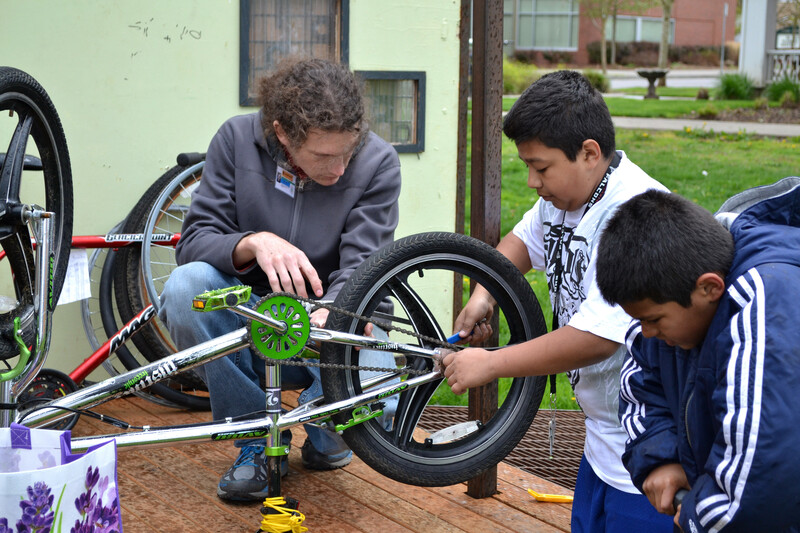 Forrest, one of our mechanics, was bent over an upturned bike, and helped a boy remove his wheel with a wrench. 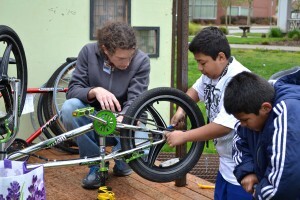 Volunteer Tom Reid, his first time at the Hub, worked at one of the bike stands with a pair of boys, showing them how to do basic bike repairs. At the other bike stand were two girls and a purple bicycle that had seen better days. Longtime volunteer, Michael Mode, carried bike parts out of the Hub. We All Can Ride committee members Michelle and Susan were tending to the lively crowd of kids who were playing in and around the Hub, waiting their turns for bike maintenance assistance on this sunny Saturday afternoon. Some kids brought their own bikes to work on. Others brought the bike of a sibling or a friend. Several kids came with a wagon stacked with bikes. All of these bikes were placed in a makeshift line, so that the kids could play in the grass surrounding the Hub until it was their turn. When ready, Michelle would call out, “Whose bike is this?” And its owner would come running. On this day, I saw 17 residents of New Columbia come to the Hub for repairs. In its history, the Hub has been open 18 times, and has seen 199 individuals for various repairs, flat tire fixes being the most common. 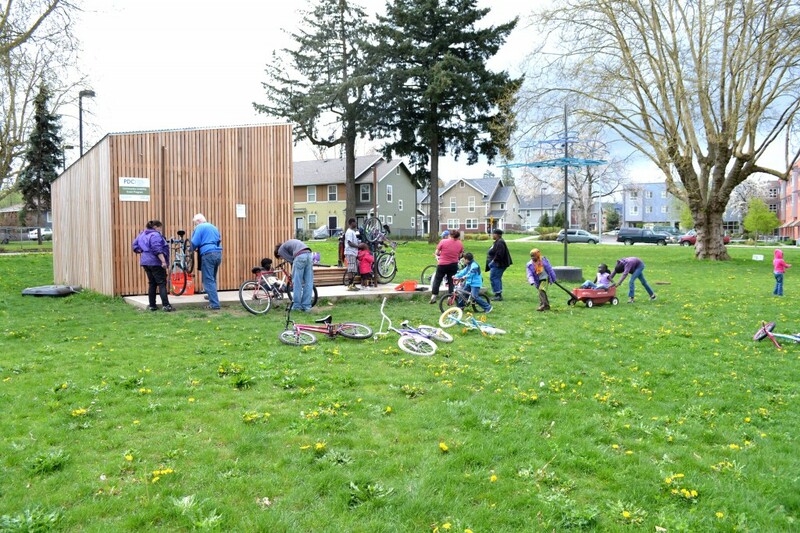 Besides serving as a place for residents to maintain their bikes, the Hub provides an opportunity for We All Can Ride members to apply the skills that they are learning as part of their Community Bike Educator training. 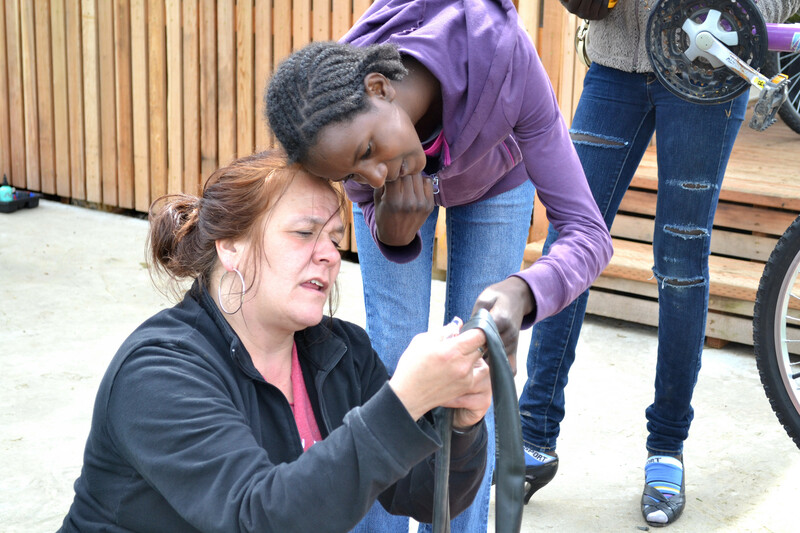 I watched Michelle patch a tube; she is eager for more training, as every bit they learn they’re able to turn around and put to immediate use to help the community. As I sat and watched the action, I realized that many of the kids weren’t just visiting the Hub, they were hanging out. It’s incredible to think that a year ago it was an empty field, and now it’s an active, vibrant space and a social destination. See more photos from the Bike Repair Hub here.